Supports both 32-bit CardBus PC Cards and 16-bit PC Cards at the same time. Allows CardBus PC Cards and 16-bit PC Cards to be shared by both portable and desktop PC. Linux Ready! Windows XP Ready! Supports both 32-bit CardBus PC Cards and 16-bit PC Cards at the same time. Supports both 3.3V Low-voltage 16-bit PC Cards and 3.3V/5V Dual-voltage 16-bit PC Cards. Bundled ISA-IRQ routing driver software routes 16-bit PC Card IRQ to shared PCI INT#. Automatic detection and configuration both 16-bit PC Card and CardBus PC Card. 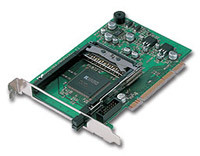 Supports Plug & Play and Hot-Swappable 16bit PC Cards, CardBus PC cards. Supports Wireless LAN 802.11a, 802.11b and Bluetooth PC Cards. Add two CardBus slot to 1U Server and share SCSI Tape backup streamers with hot swapping. Onboard speaker allows modem PC Cards to enable negotiation sounds. * ISA-IRQ routing driver must be installed to Windows 2000/Me/98SE. Fully compatible with the standard driver which is included in Windows XP. ISA-IRQ routing driver for Windows 2000/Me/98SE. Power requirements 5V/150mA via PCI Bus slot. * Does not support ZV-port . * Does not support old 16-bit PC Cards that have incorrect CIS or are not supported by Windows XP.